Speaking of love, I hope everyone had a nice Valentine’s Day. We aren’t really into doing anything huge these days, seeing as it was our 12th Valentine’s Day together. But the hubs dropped a not-so-subtle hint that it’d be nice if I didn’t wake up and immediately start baking. So I decided to just not do anything blog related Saturday. I can’t remember the last time I was actually at our house, in town, and I didn’t at least do something. It was very nice, and yet it’s hard for me to totally relax because I think of all the things that need to get done. One day I’m going to figure out how to totally unplug. Despite the super cold weather that was predicted, it was beautiful out. The last few weekends, the hubs has been working on the yard while I’ve been inside baking. He had some yard things he wanted to get done and wanted some help with, so I put on my gloves and my jacket and got to work. Happy Valentine’s Day hubs! Before that we had a nice breakfast, then we did a little wondering around some shops. We finished off the day with dinner at home and movie. Not terribly different from a normal Saturday, except that I didn’t bake, take photos, or anything. Of course when we walked through some shops, I still couldn’t turn it off completely. Pretty much every store I walked into, I was looking for new photo props. But then I make cakes like this, so I figure it’s all good. 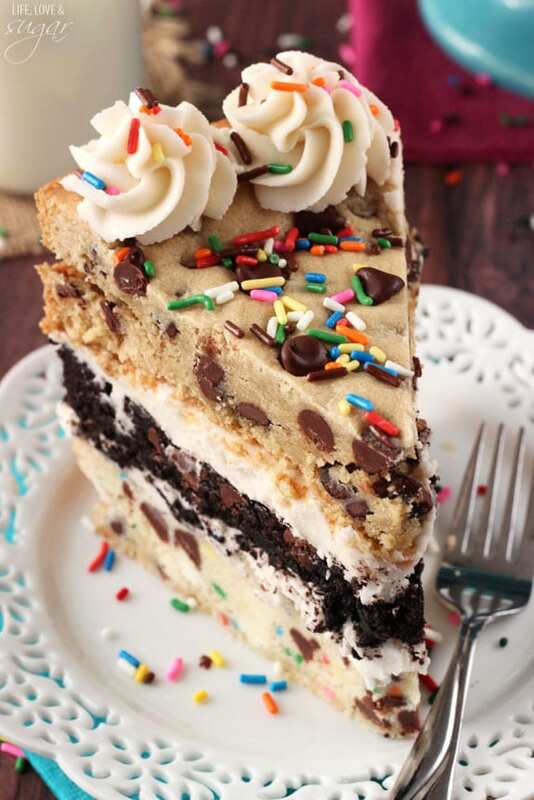 Now, you all know I have a love of cookie cakes. I’ve got quite a few of them on the blog. Shall I list them for you? 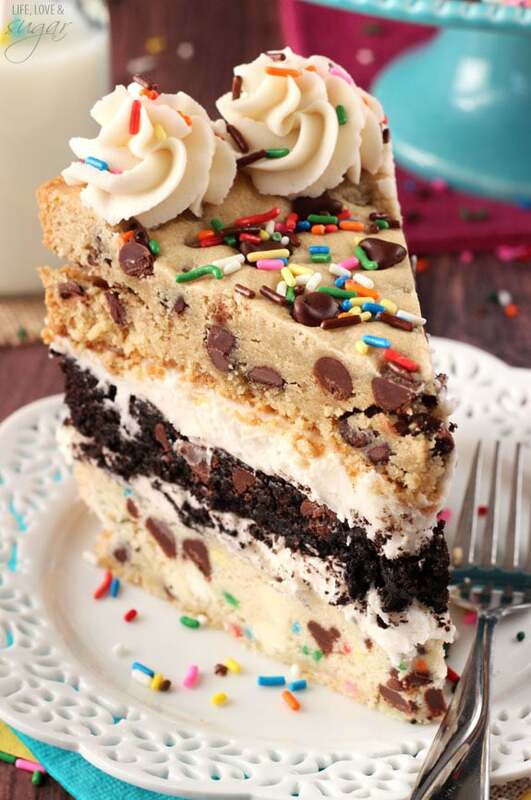 Any of those could be substituted for one of the layers of this cake, if you preferred. 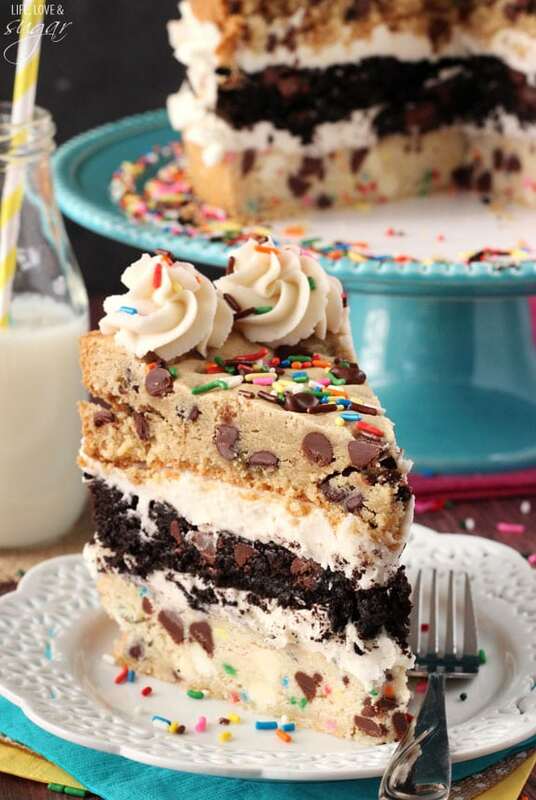 I decided to use some of my favorite and most classic cookie cakes. 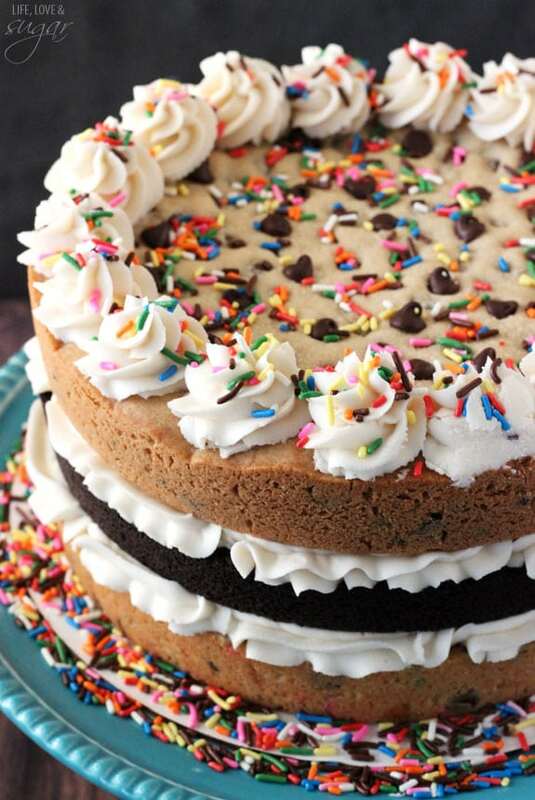 The classic chocolate chip cookie, the chocolate cookie cake, and the funfetti cake batter cookie cake (my favorite!). 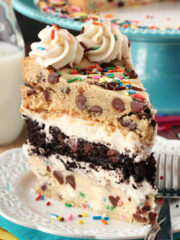 I considered using the peanut butter cookie cake, because that would be awesome too. Or the oreo…or any of them. Seriously. I could just stack them all into one big cake. I kept it simple and showcased all it’s cookie beauty by leaving it naked. Just some vanilla buttercream in between each layer, some sprinkles and bam! You’re done! 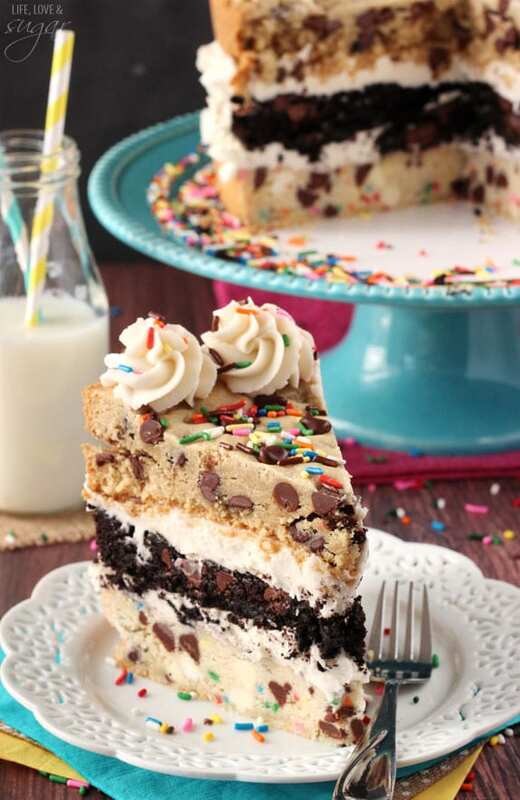 This cake is perfect for the cookie lover or someone that isn’t really into cake, but would love a fun birthday or special occasion cake. Because of all the cookie options, it’s also super customizable to your flavor preferences. You could even use all of one kind of cookie, if you wanted. So there you have it! 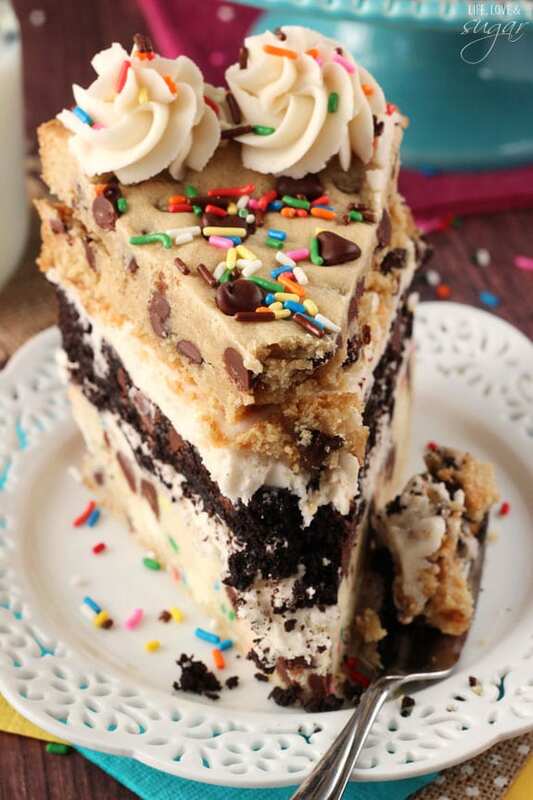 The Ultimate Chocolate Chip Cookie Layer Cake! Cookie overload, my friends! Preheat oven to 350 degrees. Place a circle of parchment paper into the bottom of a 9 inch cake pan and grease the sides. You could also use a 9 inch springform pan. Add flour, cornstarch and baking soda and mix until well combined. Stir in chocolate chips. Dough will be thick. Press the dough into an even layer in the bottom of the cake pan. Bake for 18-20 minutes or until the edges are slightly golden. Remove from oven and allow to cool mostly in the cake pan, then transfer to cooling rack to cool completely. Add flour, coca and baking soda and mix until well combined. Add flour and cake mix and mix until well combined. Stir in sprinkles and chocolate chips. Dough will be thick. Press the dough into an even layer in the bottom of the cake pan. Bake for 20-22 minutes or until the edges are slightly golden. Beat the shortening and butter until smooth. Slowly add 3 cups of powdered sugar. Mix until combined. Mix in the vanilla extract and 1 tbsp water. Add the rest of the powdered sugar and mix until smooth. Add more water to get the right consistency. Use a large serrated knife to remove the edges of the middle and bottom cookie layers, if needed. Sometimes the centers of the cookies fall a bit and it can be good to cut off the edges, so that the layers are even. 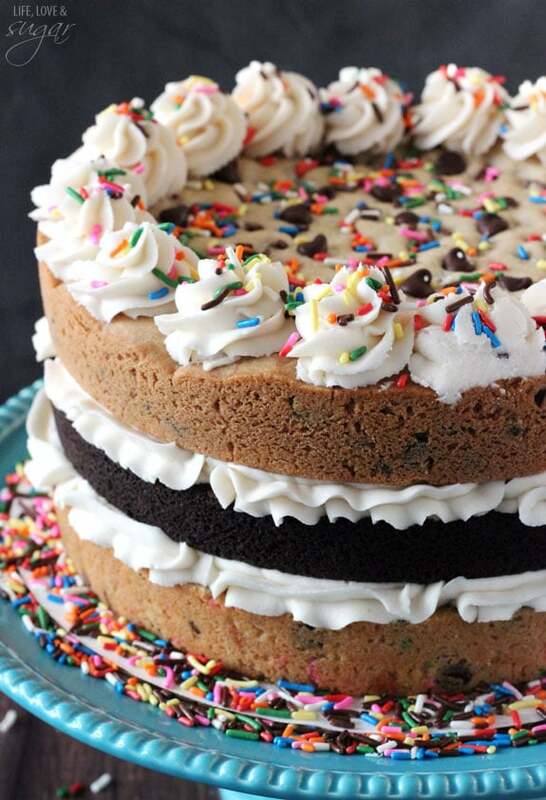 Place bottom cookie (Funfetti) on your cake plate. Top cookie with icing. I used my Ateco 844 icing tip to pipe a nice, thick layer. Top icing with next cookie (chocolate), then add another layer of icing. Add last layer of cookie (classic cookie), then finish off by piping icing around the edges and adding sprinkles. 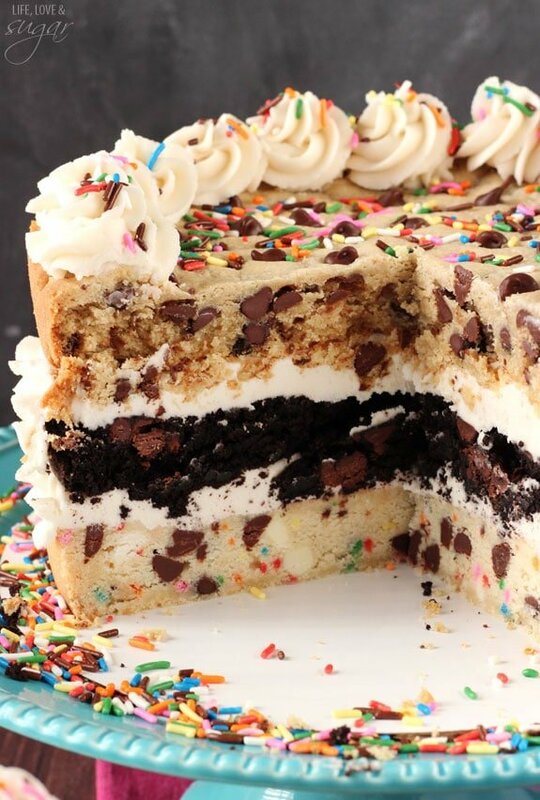 0 Response to "ULTIMATE CHOCOLATE CHIP COOKIE LAYER CAKE"